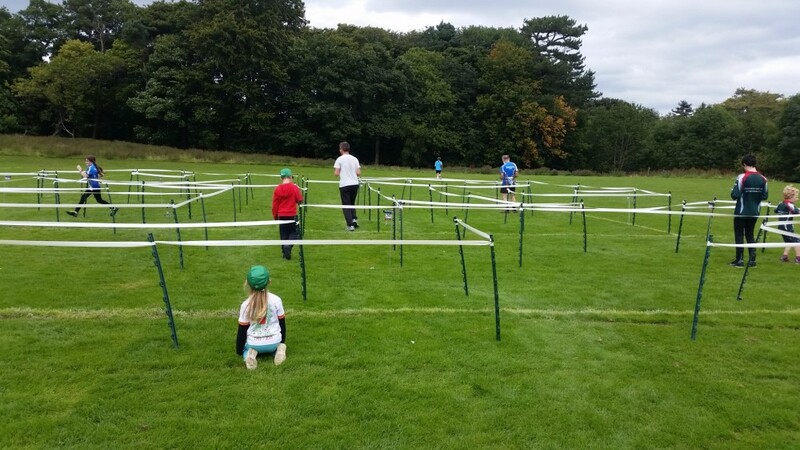 Maze combined with Park orienteering. Planner's Thanks - Thank you for attending today's event at Beeslack. We do hope you enjoyed it - the weather was kind to us which helped make it a fun day. 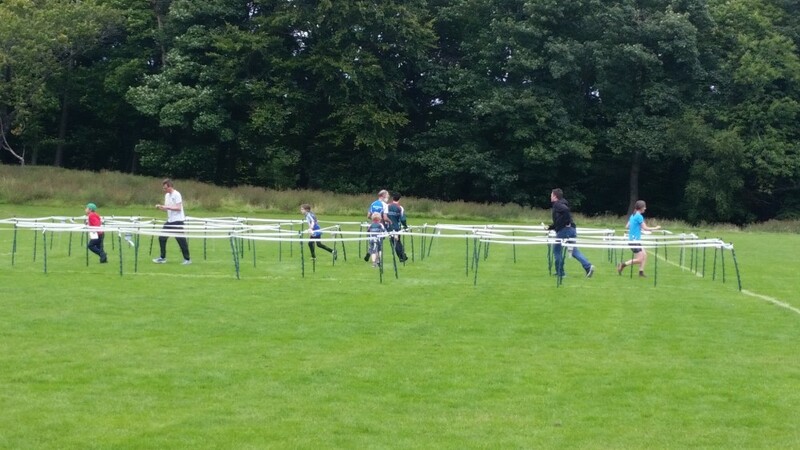 I would like to thank Fiona and the team with their fantastic work on registration, start and finish; Roger for his help and advice with the fine details and course planning; and Mark for helping me put out the maze (the right size!). Thanks to the team that helped me collect all the controls and maze before the rain started! Controller, Roger Scrutton adds: I would like to echo Jim's thanks to all involved. As far as I was concerned this was a stress free event. FORMAT: Controls in a Maze combined with some park orienteering. The challenge is to navigate around the controls in the Maze quickly and cleanly. The fastest runner may not be the most accurate. It is entertaining for the spectators and makes a very welcoming, sociable, fun event which everyone can enjoy. TOILETS: These will be available in Beeslack School adjacent to the community lounge (near Registration and Download). PUBLIC LIABILITY INSURANCE INFORMATION: Please note that participants who are not members of an orienteering club automatically have Public Liability insurance cover provided byBritish Orienteering's insurance policy for their first three "taster" sessions. Thereafter, if they wish to continue with this cover, they should become a member of an orienteering club, such as ESOC, which includes membership of British Orienteering and Scottish Orienteering. Details of how to join ESOC are here or pick up an application form at this event. The event will be based at Beeslack High School (postcode is given for Beeslack High School). Beeslack is a community school and may well be busy on a Sunday. There will be VERY LIMITED parking at the school itself. Please use public transport if possible; Lothian buses 37 and 47 both stop outside the school (use the underpass if you need to cross the road). The 47 calls at Straiton Otherwise you will need to park in surrounding housing estates, sensibly and showing consideration to residents. DO NOT PARK ON THE A701. REGISTRATION AND DOWNLOAD: We have the use of the community lounge in Beeslack School for the event. Registration will be here along with download which you need to do after each race. You may leave bags here but accept it is at your own risk. DOWNLOAD: You must download immediately after you complete each course. You are then free to clear your SI dibber and start your next course. STARTS: Close to Registration. There are no allocated start times. Starts open at 13.30 and the start procedure is described below under 'Course Information'. Four separate courses. Courses 1,2 and 3 will each be approx. 1.3km in length and will all visit the maze. These courses will have no control codes in the second column. It is up to you to make sure, by accurate map reading, that you are at the right control. The winner's time is the combined time for Courses 1, 2 and 3. Apenalty of 2 minutes will be added to your time for each control wrongly punched. You will be allocated to a course for your 1st run at 'check' then join the other queues when you come back for your 2nd and 3rd runs. The maze only course will have control codes in the usual way. Course 3 crosses the road. During this run and whilst going between the school and start/finish please take great care crossing the road. It is usually a quiet road but there may be cars parked on it, particularly if sports matches are on. There will be 'runners on the road signs' but it is your responsibility to cross safely. Members of the public also use this area. Please be considerate to them and also to other runners, particularly in the maze. The courses are planned to avoid running across the sport pitches. If games are on there may be spectators so be careful and slow down. At the finish you will be asked to hand in your map after your first and second run and will be able to keep your third map. Advance entry via Fabian4 closed on Sunday 27th August 2017. There will be some entry on the day (EOD). Free SIcard hire, if required, but £30.00 charge if lost. NOTE that SI air will not be used. This would not work because of the maze. Entry on the day (EOD) will be subject to map availability. This entry fee covers all four courses. MAZE ONLY OPTION: There will be a Maze Only option available for £2.